Topic Index for "WordPress Genesis Framework"
Find out about the Genesis Framework and why it is so popular with users. See what sets these WordPress themes apart from the rest. For small business website owners, it is essential to find the right theme framework that will help boost your business. Currently, the two most powerful and popular theme frameworks available for WordPress are the Thesis Framework and Genesis Framework. These frameworks are great and easy to use but you must choose one and stick with it as it’s very difficult to change your framework especially when your site is already established. You can get a penalty from Google when you make the switch and frameworks have different HTMLs so switching is highly complicated. It is important to note that both the Thesis and the Genesis platforms are from well respected developers. 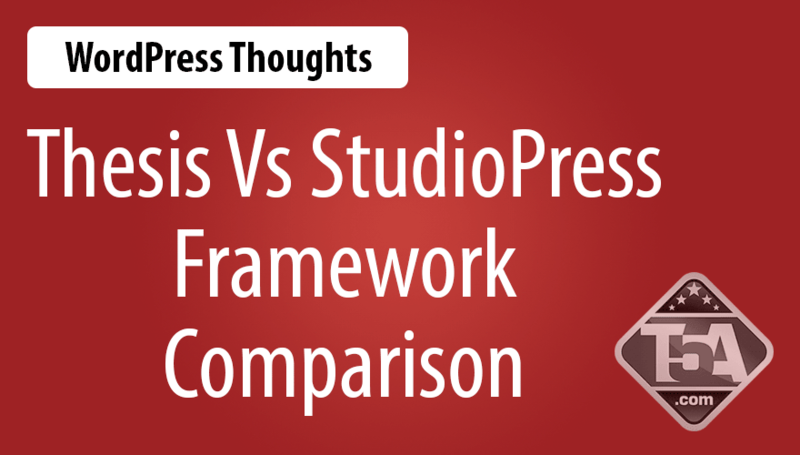 Studiopress is the developer of the Genesis Framework while DIYThemes developed Thesis. With that said, you know you can never go wrong with any of the two and your choice will be based only on your preference and need. One of the top considerations of website owners when looking for a premium wordpress theme is its price. If the price is too high many would run and hide. With Thesis and Genesis, their prices vary and each has its own pros and cons. Starting with Thesis, the price is at $87 for its personal option and $164 for the Developers. With its Personal Option you are allowed to use it on your personal website with 1 development center that is localized. This option is great for beginners who only intend on using it with just one website. The Developer’s Option packs more as you can use the framework in as many sites as you want provided that these are your own personal or business sites. If it’s for a client then you are to pay an additional fee. The price for the fee can go as low as $32 per website if you buy 10 licenses. The Developers option is great for personal use with multiple websites but can get a bit more expensive when you use it for your clients. For 10 licenses at $32 each that already adds up to $320 plus $164. With Genesis, the Framework alone costs $59.95 but if with theme then it’s at $79.97. Their Pro Plus is priced at $299.95. The $59.95 price allows you to use their Framework to as many sites as you want whether it’s your own personal websites or for your client. The $79.97 package option lets you use their Framework inclusive of a child theme to as many websites you want. Their Pro Plus Package costing $299.95 lets you use their Framework and all the themes that are also developed by StudioPress. The number of child themes continues to grow so you will get a lot of options to choose from. The big advantage is that these child themes developed by StudioPress are yours for free. In comparison, the Pro Plus Package is cheaper than the Developer’s Option if to be used with several clients. To compare Thesis Vs Genesis in terms of their base designs is easy as each one has their own style. With Thesis you can choose from the skins available while Genesis calls these base designs as child themes. DIYThemes don’t offer skins so you will have to get them from a 3rd-party developer and the selection are plentiful. Some skins are available for free while many are priced from over $30 to as high as over $80. There are memberships available from these developers so you can get a cheaper rate for multiple skin purchases. Child Themes are also made by StudioPress so you are not dependent on any third party developers to get your theme. The big advantage to this is that when StudioPress updates the Genesis Framework then all the child themes will already be supported. There are many Child Themes available for your selection but if StudioPress’ selection isn’t enough for you then they also have a marketplace wherein you can purchase Child Themes from other developers that are approved by StudioPress. The price for each Child Theme is $24.95. The customer support of Thesis vs Genesis customer support is practically at par with each other. That’s because both are offering great support so customers are assured they won’t end up spending days to get a response from the team. Both have their support forums which is great as you can get answers from their representatives and from other webmasters as well. If there’s one advantage Thesis has over Genesis in terms of customer support is with their online manual. You can even copy some of the snippets that you’d want to share in your websites. Genesis does not have a user manual. All in all, Thesis and Genesis deserve their spots as the two most competitive Framework Systems for WordPress. Other similar Frameworks can’t compare. You can never go wrong whether you choose Thesis or you choose Genesis. What’s important is that when you choose one you got to make sure you already made up your mind as you have to stick with it until the end. If you only work on your own personal and business websites so you only pay $164 for unlimited use. Your budget and need are really the two factors you have to consider when making a selection. By answering the guide listed above, you won’t go wrong in making the right choice for you.